Vollmer at LT and Fleming at RT. Cannon isn't on the sideline. Cannon (toe) return is questionable. 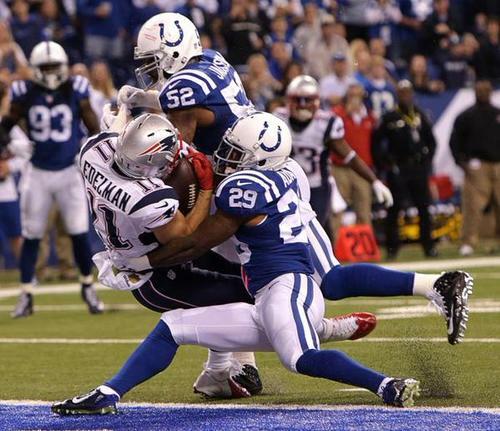 Best I've seen the Colts run defense play vs. the Patriots in like 4 years. Not saying much. Starting LT Marcus Cannon has a toe injury & his return is questionable. That sparked the flip of Sebastian Vollmer from right to left side. End of the first quarter tied at 7. Sebastian Vollmer last played left tackle in 2009, starting 5 games in place of injured Matt Light. One of those games was vs. Colts. Greg Toler might want to wake up, because Tom Brady's coming at him all night. 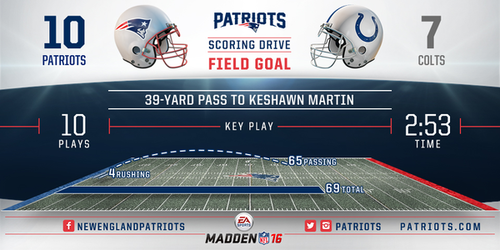 WR Keshawn Martin, with that long catch, picks up his sixth reception of the season. Had 6 all last season with the Texans. Brady's completions: Edelman, Amendola, Edelman, Amendola, Chandler, Edelman, Edelman, Edelman, Martin. It's like the Colts have been playing 10 Mississippi before trying to get any pressure on Brady. 40 yarder is good from Gostkowski. Who knew Tom Brady could throw it deep? Patriots RB snap tracker (through 2 drives, includes penalties): Dion Lewis 12, LeGarrette Blount 7. Patriots lead 10-7 (13:48 left in 2Q). Gostkowski now 11-for-11 on field goal attempts to start the season. Blitzing Brady paid off on that third down. Have really, really pick your spots when you do it though. He eats blitzes. Longest pass of the night so far for Luck. That one had plenty of zip. That throw looked just fine to me. Moncrief in the deep middle. 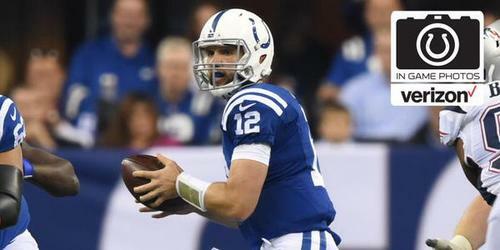 Nothing wrong with Luck's shoulder. Wow throw there. Dominique Easley got off the ball very well, "disruptive" on that pass play. The delay is about an injured member of officiating crew. Pats really rotating heavily along their defensive line. Everyone getting snaps tonight. Vollmer back at LT and Fleming at RT.